construction (including safety); building and plumbing services; approach to sustainability; and asset and facility management. was in 2005, to which two amendments were issued in 2015. 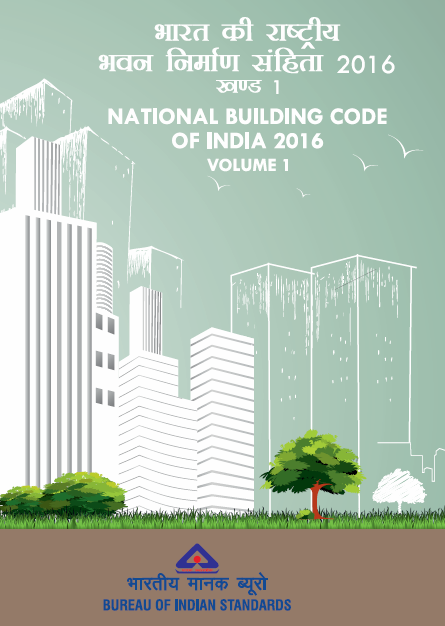 Code has been brought out in 2016 as National Building Code of India 2016 reflecting the state-of-the-art and contemporary applicable international practices. a) Provisions for association of need based professionals and agencies have been updated to ensure proper discharge of responsibilities for accomplishment of building project. b) With a view to ensuring ease of doing business in built environment sector, a detailed provision for streamlining the approval process in respect of different agencies has been incorporated in the form of an integrated approval process through single window approach for enabling expeditious approval process, avoiding separate clearances from various authorities. computerization of approval process has been detailed, enabling online submission of plans, drawings and other details, and sanction thereof, aiding in speedier approval process. d) The mechanism of ensuring certification of structural safety of buildings by the competent professional and peer review of design of buildings, have been further strengthened. e) Requirements for accessibility in buildings and built environment for persons with disabilities and the elderly have been thoroughly revised and updated. f) Provisions on fire and life safety have been thoroughly revised to meet the challenges of modern complex building types including the high rises. earthquake resistant design of buildings, steel design and foundations have been incorporated with a view to ensuring structural safety of buildings including against a disaster. h) Provisions relating to all building and plumbing services have been updated keeping also in view the latest international practices as related to the country. new/alternative building materials and technologies to provide for innovation in the field of building construction. k) Construction management guidelines have been incorporated to aid in timely completion of building projects with desired quality in a safe manner within the budgeted cost. n) New chapters have been added on structural use of glass; escalators and moving walks; information and communication enabled installations; solid waste management; and asset and facility management. The Code has been published in two volumes containing all the Parts and Sections. The publication is available from Sales Counter at BIS Headquarters as well as various Regional and Branch Offices of BIS. 1) Detailed provision for streamlining the approval process in respect of different agencies in the form of an integrated approval process through single window approach thereby avoiding separate clearances from various authorities, with a view to ensuring ease of doing business in built environment sector. 2) Progressive computerization of approval process, for enabling online submission of plans, drawings and other details, and sanction thereof. 3) Updated mechanism of ensuring certification of structural safety of buildings by the competent professional and peer review of design of buildings. 4) Defining the roles and responsibilities of all professionals and contractors involved in a building construction project. 5) Comprehensive planning norms for minimum amenities to be provided in a city/town. 6) Detailed provisions relating to requirements for accessibility in buildings and built environment for persons with disabilities and the elderly. 7) Planning and development norms, such as, Transferable Development Rights (TDR) and Accommodation Reservation (AR). 9) Norms for solar energy utilization. 10) Requirements for buildings on podium for ensuring fire and life safety in such buildings. 11) Fire and life safety in modern complex buildings including the high rises, glazed buildings, atria, commercial kitchen and car parking facilities. 12) Updated structural design provisions for wind and seismic loads, imposed load due to helipad, and blast loads, for safe design and construction of buildings with due focus on ductile detailing. 13) Latest research and development inputs and provisions on concrete, steel and masonry buildings with a view to ensuring disaster resilient buildings. 14) Assessment of liquefaction potential of a site and ground improvement techniques for maximum utilization of land resources including at seismically vulnerable sites. 15) Updated provisions on engineered use of bamboo in housing and other building construction. 16) Promotion of use of agricultural and industrial wastes including construction and demolition wastes in building construction without compromising the quality and safety. 17) Inclusion of provisions on self compacting concrete, high performance concrete and steel fibre reinforced concrete. 18) Updated provisions on prefabricated construction technique for speedier construction. 19) New chapter on structural use of glass in buildings. 20) New and alternative building materials, and technologies for building construction such as, reinforced masonry, confined masonry building construction and masonry wall construction using rat-trap bond. 21) Construction project management guidelines for timely completion of building projects within the budgeted cost with desired quality. 22) Habitat and other welfare requirements for workers at construction site. 23) Inclusion of modern lighting techniques such as LED and induction light and their energy consumption. 24) New provisions on compact substations and updated provisions on installation of energy meters. 25) Comprehensive provisions relating to lightning protection of buildings. 26) Provisions on aviation obstacle lights; electric vehicle charging and car park management. 27) Protection of human beings from electrical hazards and against fire in the building due to leakage current. 28) Use of refrigerants for air conditioning addressing zero ozone depletion potential (ODP) and ultra-low global warming potential (GWP). 29) Inclusion of new and energy efficient options of air conditioning, heating and mechanical ventilation, such as variable refrigerant flow system, inverter technology, district cooling system, hybrid central plant using chilled beams, radiant floor components, and geo-thermal cooling and heating. 30) Thrust on envelope optimization using energy modelling, day lighting simulation, solar shade analysis and wind modelling software to optimize the air conditioning load. 31) Air conditioning, heating, and ventilation (HVAC) provisions considering adaptive thermal comfort conditions for energy efficiency. 32) Provisions pertaining to metro trainways and metro stations with respect to fire and life safety; and air conditioning, heating and ventilation for metro stations. 33) HVAC requirements for data centres and healthcare facilities; refrigeration for cold stores; efficient strategies for winter heating using reverse cycle operation, solar heating systems, ground source heat pump and electric heat pump; and modern system of mechanical ventilation for industries, commercial kitchen and underground car parking. 34) Updated provisions on building automation system to include the latest practices for web-based monitoring and control of performance parameters. 35) High speed lifts for tall buildings. 36) New chapter on escalators and moving walks for comfortable and safe movement of people. 37) New chapter on information and communication enabled installations in buildings. 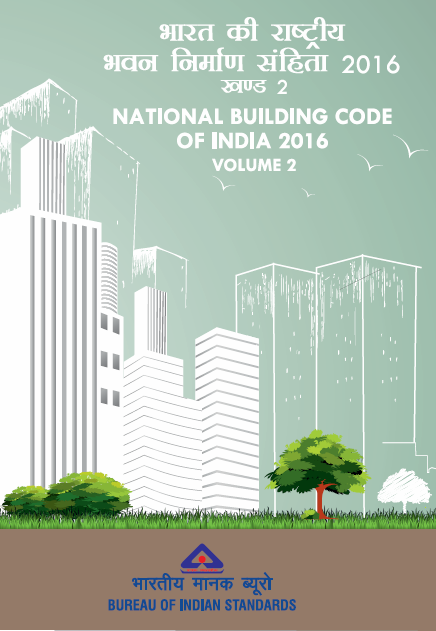 38) Updated provisions on water supply, drainage and sanitation for modern high rise buildings and complexes. 39) Provisions relating to swimming pools covering hygiene and safety. 40) Updated provisions on rainwater harvesting. 41) New chapter on solid waste management covering various solid waste management systems within the building and building complexes. 42) Updated provisions on piped gas supply in houses, and in hospitals for medical purposes. 43) Promoting quality of outdoor built environment through updated provisions on landscape planning, design and development. 44) Promoting sustainability in buildings and built environment in tandem with relevant sustainable development goals. 45) New chapter on asset and facility management to cover provisions relating to management of building assets and associated services, also covering responsibilities of occupants for maintenance of facilities, such as structures, equipment and exterior property.